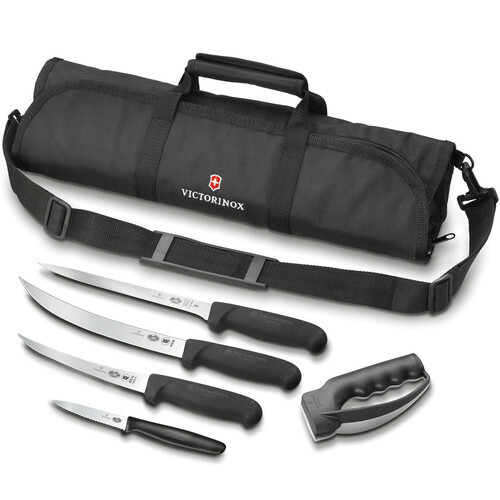 Designed for the outdoor enthusiast, this Fish Fillet Kit from Victorinox comes with the main tools you need to cut and prepare your meat no matter where you happen to be. Four stainless steel knives are complemented by a handheld sharpener to help you keep your utensils in good shape, as well as a partitioned carrying case with a top handle and adjustable shoulder strap for simplified storage and transport. With a length of 10", the breaking knife is the largest blade in the set and can be used to easily segment your meat. An 8" fillet knife and 6" boning knife are provided for removing the scales and perfecting your cut, while a 3.25" paring knife is available for general slicing and chopping of small items. All of the utensils in this set feature an anti-slip Fibrox handle with the exception of the paring knife, which has a regular nylon grip.